Fresh on the heels of Senior government Minister and General Secretary of the United National Party Kabir Hashim making representations to the President and the Prime Minister of serious lapses that can lead to billions of rupees of damage to the state coffers due to actions or inactions by the management of the Sri Lankan Airlines, Prime Minister’s office was last week alerted to another possible scandal that will damage investor confidence in the country. This comes from another state agency that appears to continue its legacy from the previous government of major allegations of scandals and corruption – The Sri Lanka Ports Authority – SLPA. One of India’s largest port services companies, Ocean Sparkle Limited (OSL), valued last year at around US$500 million with majority stakeholders being global funds including World Bank’s IFC, Standard Chartered Bank and funded by the Asian Development Bank, wrote to the Prime Minister last week, alleging that despite being the lowest bidder and despite the Cabinet Appointed Procurement Committee (CAPC) recommending an award of a tender to provide tug boat services to the Port Authority, in a deal worth millions of US dollars, to OSL, SLPA is yet to award the tender after almost one year since the tender was called. OSL in their letter to the Prime Minister alleges that this delay is causing them heavy financial losses as the tender specified the tug boats needs to be deployed in 30 days of the award and therefore the company is currently keeping on standby these two “highly capital intensive assets” and is unable to make use of the boats elsewhere. SLPA invited tenders for the hire of two tugs to be deployed by the 15th September 2016 for a period of one year with a possible extension for another year. SLPA has also asked the company to keep on extending the bid bond validity since November last year until now, at “significant cost and expense”. Documents attached to the representation made to the Prime Minister show that the Ministry of Ports and Shipping has informed the bidders of the decision to award the tender to the two lowest bidders, OSL and Sri Lanka Shipping Company (SLSC), on 2 November 2016. In their letter, the Ministry informs the unsuccessful bidder, Keppel Smit Towage Limited of Singapore (KSTL) that KSTL has seven days to appeal against the award decision to the Procurement Appeal Board (PAB) of the Presidential Secretariat. OSL claims that, to their knowledge, no such appeal had been made. P. Jairaj Kumar, Chairman and Managing Director of OSL, says that the Minister of Ports and Shipping, Arjuna Ranatunga met with the company in Hyderabad and requested that the company changes its bid and also submit another “unsolicited” proposal for a long term charter of two tug boats (the tender was for a lease of one year with a possible extension for one more year) where the two boats will become the property of the SLPA for a consideration of only one US$ at the end of a ten year charter period. Kumar says that a similar unsolicited proposal had been made by the unsuccessful bidder, KSTL, after the CAPC made known its decision to award the tender to OSL and SLSC. Kumar states that as a company that is majority owned by some of the largest global fund managers, including World Bank’s funding arm, IFC, and being granted extensive credit facilities by the Asian Development Bank, the company has to ensure total transparency in its operations. Therefore, he said, the company is unable to comply with the Minister’s request, as it also contained other “opaque commitments”. “The Asian Development Bank choose us as their first private sector investment in India’s ports sector, granting us a loan of US$40 million for fleet improvement. This is the level of trust and confidence that international agencies have on us and we have to maintain very high standards in our dealings to ensure that this level of trust and confidence will be maintained”, Kumar said. 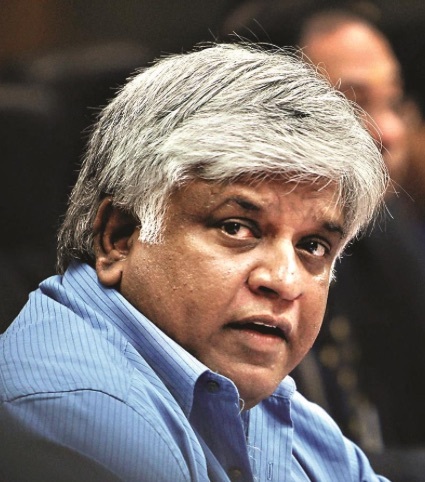 Meanwhile, in an interview with the Sunday Observer on 11 September 2016, SLPA Chairman Dammika Ranatunga, elder brother of Minister Arjuna Ranatunga, claimed that two tugs being built in China will be delivered in February 2017 (last month) and that the tender to charter the two tugs are only till the new boats are delivered. Kumar believes that these two “new tugs” are in fact the two tugs that the unsuccessful bidder KSTL had proposed to be supplied in its “unsolicited proposal” for a period of ten years – the proposal that the Minister had indicated OSL should also make. An industry insider, on condition of anonymity, said that there will be a new tender to be called by the SLPA to cover the charter the two new tug boats. “This is patently an attempt to subvert the Swiss challenge tender system the government has been trying to implement to achieve transparency and good governance,” the industry insider said. “The new tender will have very specific conditions that will only match the technical specifications of the two new tugs that SLPA chairman has mentioned in his interview with the Sunday Observer in November last year. We are not aware of a tender that was awarded for the charter of these two tugs that the Chairman mentions in this interview”, the insider said. Despite Blatant Lies By The Regime; Why People Still Choose To Elect Them? Enough Of The Diagnoses, Bring On The Cure!